Soak sabut urad and rajma overnight in three cups of water overnight. Drain. Pressure-cook the sabut urad and rajma in three cups of water with salt and half the grated ginger for eight whistles or till soft. Heat oil and butter in a pan. Add cumin seeds. When they begin to change colour add onion and fry till golden brown. Add remaining grated ginger, garlic and tomatoes. Sauté till tomatoes are well mashed and oil starts to leave the masala. Add cooked dals to this. Add two cups of water and salt, garam masala powder, red chilli powder and simmer on very low heat for fifteen minutes. Add Cream and mix well . Let the dal simmer for another five minutes. 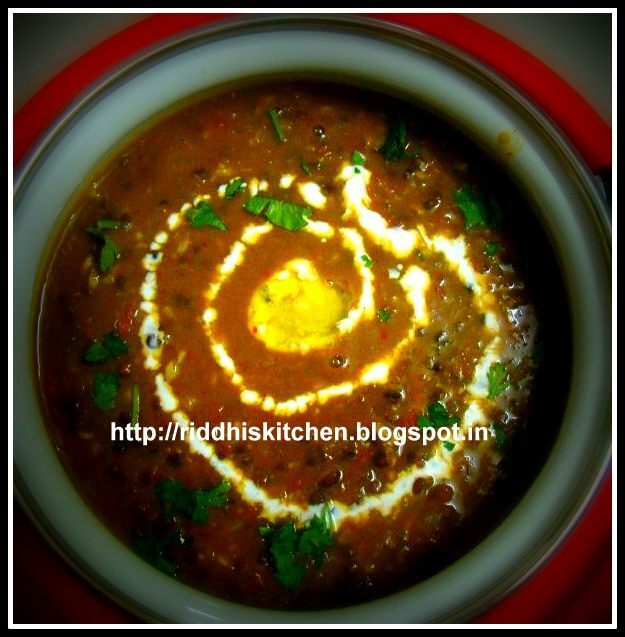 Garnish with coriander leaves and cream and serve hot with naan or parantha.